The same goal exists for rhinoplasty performed on Asians as for rhinoplasty performed on Caucasians, which is to build a natural-appearing structure that blends harmoniously with the face. As a group, Asians require augmentation of the nose to achieve this result, in contrast to Caucasians who usually require reduction. As with other types of surgery performed on Asians, successful surgery results in a feature consistent with the patient's ethnic identity. Thus, the goal of surgery should be an attractive Asian nose, not the creation of an attractive Caucasian nose on an Asian face. [1, 2] For more information on aesthetic medicine, including news and CME activities, visit Medscape’s Aesthetic Medicine Resource Center. See the image below depicting completion of rhinoplasty procedure. Previously, surgery has focused primarily on dorsal augmentation. Although still performed (especially by nonphysicians or those with limited training), injection of paraffin or liquid silicone has been replaced by alloplastic augmentation, most commonly silastic. Historically, the surgeon addressed the tip by augmenting it together with the dorsum in a one-piece, L-shaped implant with the bend of the L forming the new tip. Because extrusion at the tip remains an ongoing concern with implants of this type, the surgeon frequently protects the tip with cartilage from the ear, septum, or lower lateral cartilage. The nasal tip and especially nasal tip lengthening vis-à-vis facial thirds remains the primary challenge of Asian rhinoplasty (see the image below). Lengthening procedure (different patient) for the short nose. A graft placed behind the toboggan graft holds it out to extension. The popularity of open rhinoplasty in the United States has led to an increased interest in applying this method to Asian rhinoplasty. Nevertheless, due to the poorer healing characteristics of Asian skin, some practitioners prefer the endonasal approach to Asian rhinoplasty. For nasal dorsal augment, a recent surge of interest in autogenous reconstruction using autogenous cartilage has been observed. Costal cartilage is increasingly used in the United States. Recent attention has been drawn to diced conchal cartilage wrapped in Surgicel  or temporalis fascia. The diced cartilage obviates the problems associated with warping, which can occur with rib. As much as 4 mm or more of dorsal augmentation can be achieved using conchal cartilage. Address the problem as isolated to the dorsum, tip, alar base, vertical dimension, or all of the above. The Asian nose shares similar ideal dimensions with the Caucasian nose but with emphasis on subtleness: the dorsum requires less height, the tip less definition, the alar base less narrowness. As in Caucasians, ideally the radix begins at or slightly below the lash line. The length, measured from the idealized radix to the base of the columella (subnasale), occupies the central third of the face. The tilt of the columella measures 90-115° from the vertical plane, with higher angulation preferred for smaller women. Southeast Asians (Malay, Filipino, southern Chinese) typically require the most dorsal augmentation (4 mm or more), while northeast Asians (Korean, Japanese, northern Chinese) require less (1.5-2.5 mm) or none. It may be necessary to better define the tip and increase its projection. A deficient premaxilla may need augmentation, as evidenced by a retracted columella with deficient columellar show from lateral view. The nose may require lengthening as measured from the radix to the tip or from the radix to the base of the columella. The need for alar reduction is frequent in southeast Asians but much less so in northeast Asians. In most cases, both the flare and width need to be corrected; this necessitates an incision into the alar groove. Nasal skin's thickness better conceals the anatomic detail of the underlying nasal skeleton. This allows better blending of alloplastic or autogenous augmentation with native tissues. Nevertheless, do not use this as an opportunity for sloppiness in surgical technique, because in this patient population, expectations are exceedingly high. The more delicate cartilaginous tissues of the lower lateral cartilage generally require reinforcement with autogenous cartilage from the ear or septum to obtain a desired result. Affecting a result with pure cartilage reshaping techniques is difficult and usually inadequate. Septal cartilage frequently requires two-layered reinforcement because of its thinness. When harvesting septal cartilage, preserve 1.5 cm of caudal and dorsal septum to prevent nasal dorsal collapse. In about 20% of cases, the septal cartilage is inadequate and additional cartilage from the ear is necessary. Generally, the lower lateral cartilage is too soft and pliable to adequately support the tip. Such softness precludes the successful use of onlay grafts to the tip, except for the rare patient who has sufficiently strong cartilage (about 10% of patients). Currently, when the author performs an open rhinoplasty, preference is given to creating a columellar strut combined with a shield graft when the septal cartilage is sufficiently strong. In many cases, septal cartilage as an anterior strut graft appears adequate for tip projection in closed rhinoplasty, if a minimum of 22 mm of cartilage can be obtained to act as both a strut and a shield graft. When an endonasal approach is used, a 1-layered graft appears adequate to maintain durable tip projection. When tip grafting, defatting should be limited in order to decrease the likelihood of graft visibility. This is particularly true in the open approach, as the 2-layered graft combined with a columella incision can lead to compromised circulation at the tip area and more significant scarring. The shorter and more delicate nasal bones place the patient at higher risk for internal valve collapse; consider spreader grafts in the rare patient requiring isolated dorsal reduction. Fortunately, alloplastic dorsal augmentation functions as a spreader graft, precluding the need for this as a separate maneuver in many cases. Because of the shorter height of the nasal bones, the author finds that a curved osteotome provides a more consistent result than the percutaneous approach. The indication for Asian augmentation nasal surgery is a patient with realistic expectations and mental stability. Asian male rhinoplasty patients appear to have a higher rate of dissatisfaction from nasal surgery. Careful screening is recommended, especially with regard to outcome and the likely shortfalls of the operation. First analyze the nasal dorsum, which begins at or slightly below the eyelash line. A straight line drawn from this point to the supratip area determines the appropriate dimensions of the nasal implant. Because of the high visibility of implants ending in the mid dorsum, it may be necessary to lower the height of the dorsum to accommodate a longer implant, even if the dorsal deficiency appears isolated to the radix. Next, assess the nasal tip for three characteristics: the need for increased projection, tip definition, and/or length from radix to tip. Because of their interrelationship, the need for improvement in any one of these aspects impacts the other two. The resilience of the lower lateral cartilage determines the approach used to correct the deficiency. According to Millard-Sheen, a well-developed firm nasal tip may require nothing more than a suture-reshaping technique or a graft isolated to the nasal tip identical to a Caucasian rhinoplasty. More typically, a tip grafting technique is required. As the tip becomes increasingly delicate, construct increasingly substantial tip cartilage. Septal cartilage graft secured to the columella. As mentioned above, when using an open approach, the author prefers conchal cartilage, made 2 layers thick, to serve as an anterior strut graft. Perhaps owing to circulatory disruption, septal cartilage appears to weaken or resorb over time, resulting in the loss of tip projection. The endonasal approach preserves better circulation to the tip area, and this may explain the better survivability of cartilage tip grafts. Next, look for maxillary spine deficiency, as evidenced by a retracted columellar base and an acute nasolabial angle. The degree of deficiency may require a plumping graft of cartilaginous tissue. Finally, determine whether the alar base requires correction of width or flare. Increasing the projection of the nasal tip usually obviates the need for this in the northeast Asian population (Koreans, Japanese). More frequently, this procedure is performed on Southeast Asians such as Filipinos and Malay. When correcting the flare, the surgeon should avoid a pasted-on appearance of the nostril at all costs. This is done by preserving a slight curvature to the nostril when making the lateral incision. Prior injections of liquid silicone or paraffin to the nasal dorsum predispose patients to infections when the nose is augmented with alloplastic material. The patient should accept the risk of infection rates, which border on 40% or more. Gao Y, Niddam J, Noel W, Hersant B, Meningaud JP. Comparison of aesthetic facial criteria between Caucasian and East Asian female populations: An esthetic surgeon's perspective. Asian J Surg. 2016 Sep 11. [Medline]. [Full Text]. Ishii CH. Current update in asian rhinoplasty. Plast Reconstr Surg Glob Open. 2014 Apr. 2 (4):e133. [Medline]. [Full Text]. Erol OO, Gundogan H. Diced cartilage grafts in rhinoplasty surgery. Plast Reconstr Surg. 2005 Sep 15. 116(4):1169-71; author reply 1171-3. [Medline]. Daniel RK, Calvert JW. Diced cartilage grafts in rhinoplasty surgery. Plast Reconstr Surg. 2004 Jun. 113(7):2156-71. [Medline]. Erol OO. Tip rhinoplasty in broad noses in a Turkish population: Eurasian noses. Plast Reconstr Surg. 2012 Jul. 130(1):185-97. [Medline]. Kim EK, Daniel RK. Operative techniques in Asian rhinoplasty. Aesthet Surg J. 2012 Nov. 32(8):1018-30. [Medline]. Kim JH, Park JP, Jang YJ. 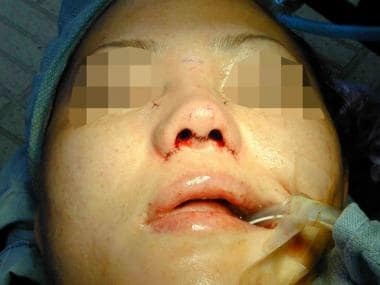 Aesthetic Outcomes of Alar Base Resection in Asian Patients Undergoing Rhinoplasty. JAMA Facial Plast Surg. 2016 Jul 21. [Medline]. Flowers RS. 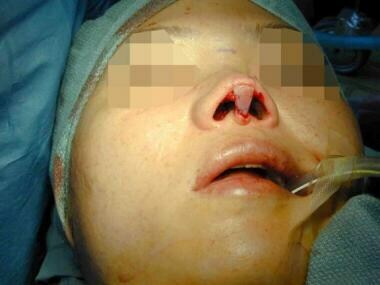 Problems in rhinoplasty in Orientals. Problems in plastic and reconstructive surgery. 1991. 1:582-608. Flowers RS. The toboggan graft: A better way of cartilage grafting in the nose. Plastic Surgery Forum, PSEF. 1987. Kim CW. 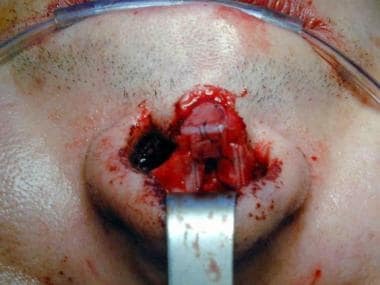 Complications of rhinoplasty. Problems in plastic and reconstructive surgery. 1991. 1:609-613. Song IC. Changing concepts in cosmetic rhinoplasty in Orientals. Problems in plastic and reconstructive surgery. 1991. 1:572-581. Placing an intercrural 6-0 Prolene taper needle suture to stabilize the framework. A 2-mm osteotome placed percutaneously. Perform this step prior to tip work. Marking for alar base resection. Disclosure: medical consultant and speaker for: Misonix, Inc, medical consultant; Cytori, medical consultant; PolarityTE. Disclosure: receive royalities as author of textbook aesthetic nasal reconstruction for: aesthetic nasal reconstruction.com.